The Dalmatian Coast, Croatia’s prime pearl, and the highly regarded coastal area is nothing short of breathtaking. This slice of paradise is sprinkled with charming villages and towns and it’s salty and cool sea is populated with idyllic islands as far as the eye can see. Split is the most famous and the largest city in the area and plays host as the hub of Dalmatian. While there are plenty of things to do in Split, the surrounding towns all have something up on offer and are simply gorgeous. While many would think to relax on the beaches, I wanted to get adventurous instead! 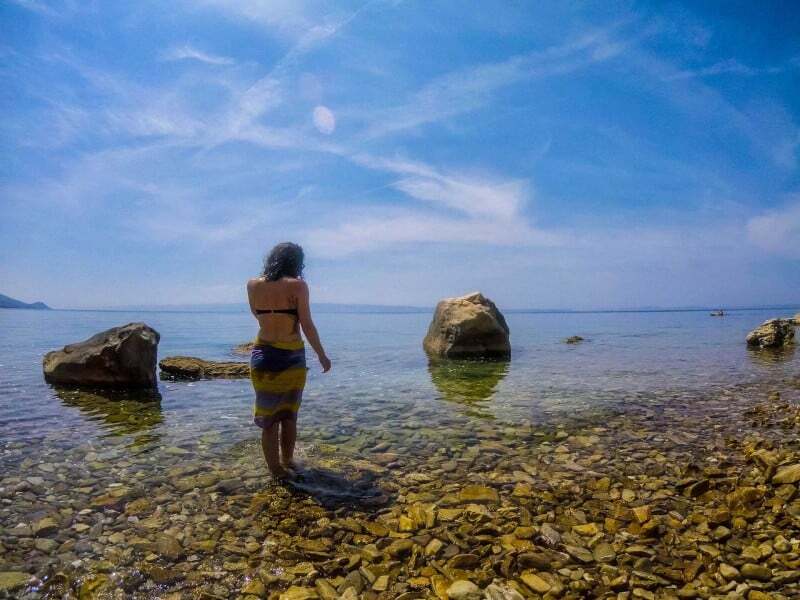 Check out all the adventures day trips around Split… But don’t say I didn’t warn you, the adventure is addicting! I had such a wonderful time in the region but my time here was just not enough… Is it ever? You think you can squeeze everything you want to do in but then once you get there and learn about more things that interest you, your time just slips away. I thought I’d be in Split the majority of the time and then wander around to a few other nearby spots. However, what ended up happening is I spent my evenings in Split as that’s where my hotel was but I adventured around Omis mostly. 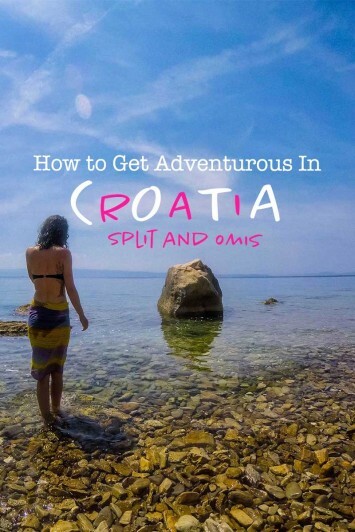 Split has some similar activities, but Omis seemed to be more of the adventure hub! 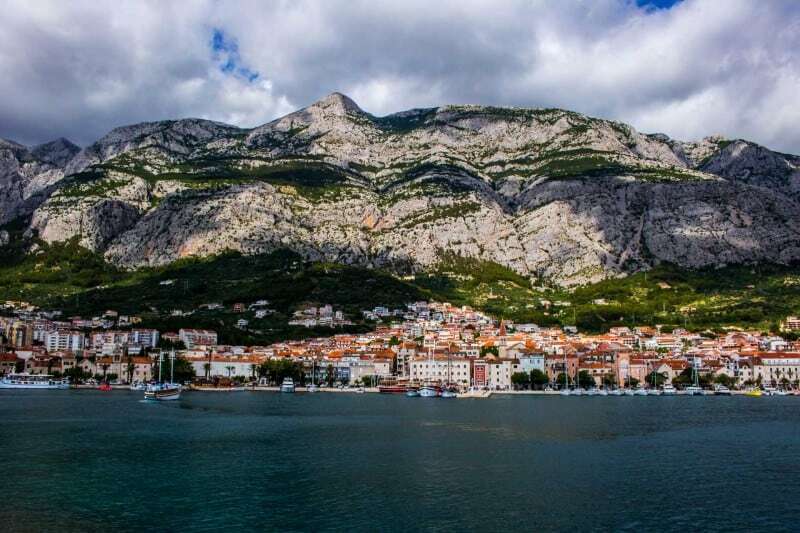 If you’re here just for the adventure, I’d recommend basing yourself in Omis as opposed to Split. Split has some great nightlife and the port is there for those wanting to island hop, but I felt Omis and Makarska were more on par with my scene. But there’s little to go wrong when you’re on the Dalmatian Coast! And luckily, getting around Croatia is pretty easy and safe! The Cetina River is a crystal-green river that snakes through the mountains of Omis and then spills out into the Adriatic Sea. Having the opportunity to jump in these waters is something impossible to pass up, especially on those hot summer days! OK so today not a hot summer day and it, in fact, was kinda chilly, hence the wetsuit. But look at that cool fog ahead! The water was incredibly refreshing and the rapids are tame (level 2) but still really fun. I’ve never heard of white water raft surfing before but we did it! It’s when you make your raft surf the white water rapids, which was pretty fun and a sure way to get even more exercise for those arms. We even attempted to “sink” our raft (impossible but fun to try) in the rapids! Cliff jumps and opportunities to jump out for a swim are possibilities too! Just keep in mind the water can be pretty cold depending on the time of year you come but rafting companies will provide a wetsuit for you. The quick backstory of me and ziplining – I’ve had many opportunities to do it but they all seemed a bit underwhelming. They zoomed over treetops, once, and that was it. No view, no second round, not really exciting… I get the adrenaline reason but I also want a view and for it to last more than a few seconds. Am I being picky? Maybe, but I found a zip line that checked all the boxes for me! 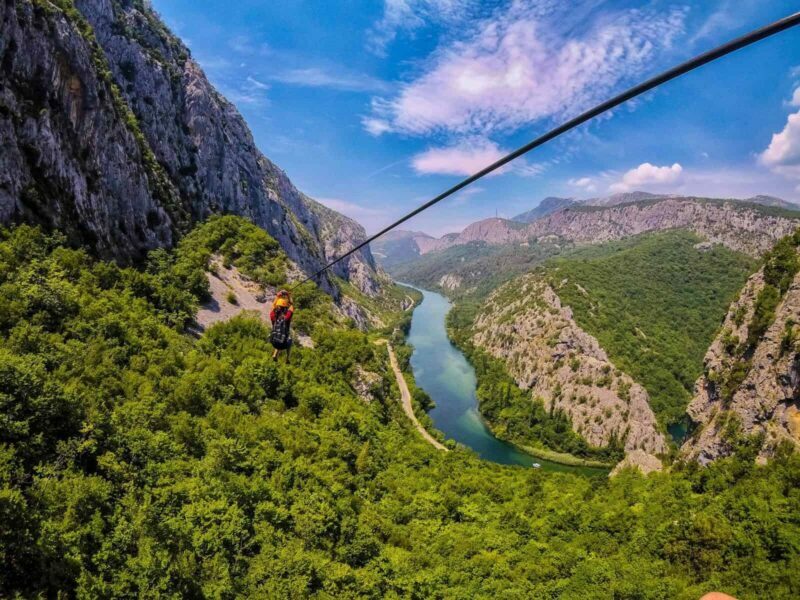 Out of all the things to do in Split and Omis, Croatia—Zip lining was the most epic! What more could you ask for? Zipline Omis Croatia has EIGHT zip lines that you get to enjoy and all but about two have simply spectacular views of the Cetina River (the river you go rafting on) and the surrounding mountains. You start from up high and hike from line to line. I’ve never felt a rush like I did when I zip lined here! Probably because I’m actually afraid of heights, however, I choose to do these types of things anyway and ignore my fears (FOMO or crazy? Still not sure yet). 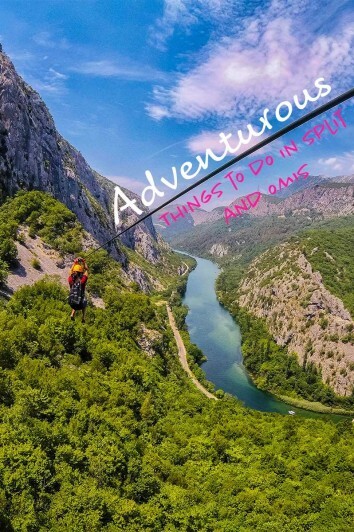 Out of everything adventurous I did in Croatia, this was my favorite tour from Split and I’d recommend it to anyone wanting an afternoon of thrills. NOTE: This the only zip line company! They are extremely reliable. They can book out since they are the only company so be sure to prebook if you definitely want to go! I really enjoy rock climbing but I had yet to experience it outside of Krabi, Thailand! I must say, Omis does bear some resemblance though, so as soon as my hand latched on to my first chunk of limestone, I clambered up those rocks like a monkey. OK, well, not as good as a monkey and definitely with more scraps than a monkey would acquire, but yeah… I climbed up! And the views were great! 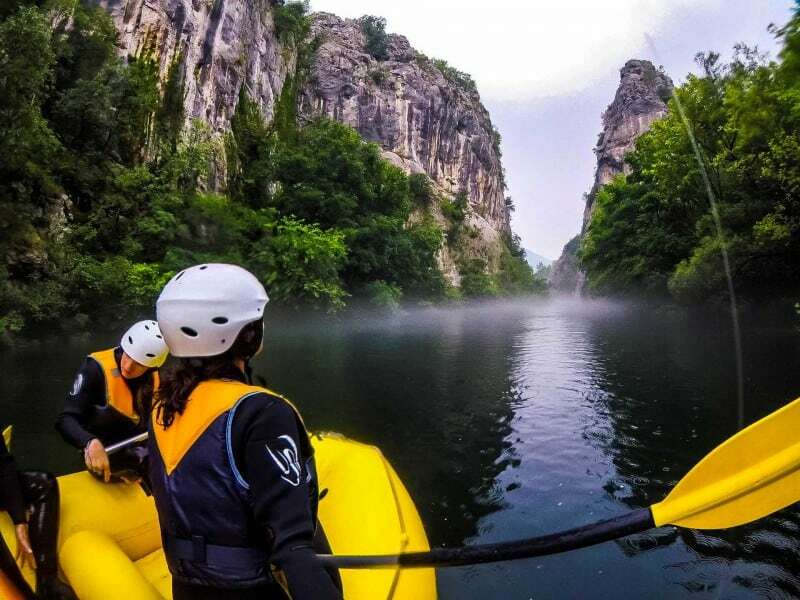 I hope you’re not tired of the Cetina River yet because guess what…? Heres another bird’s eye view of this stunning river. 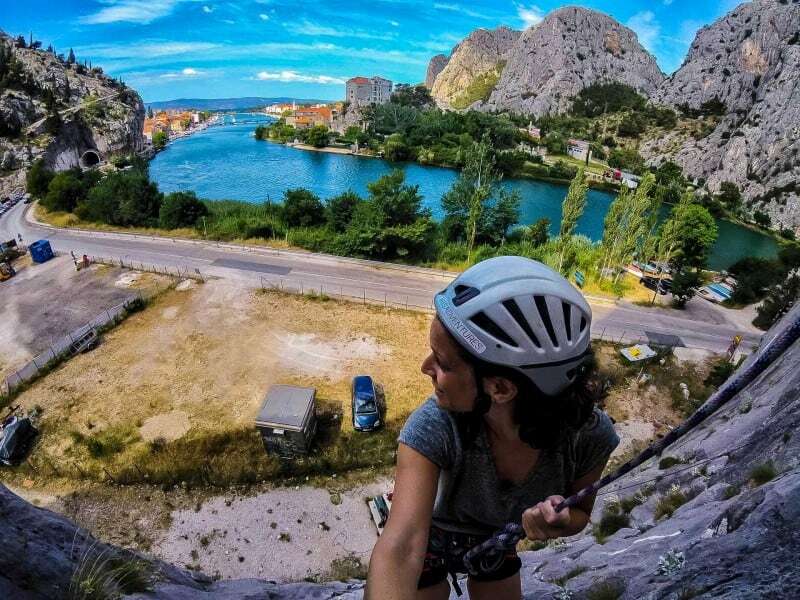 Rock climbing in Omis is so cool! And that’s the Cetina River spilling into the sea behind me! If you go with the company I went through you can’t go wrong. Iris is a vivacious human who could not be more in love with climbing if she tried. Climbing is her life. She has lead professional expeditions and has climbed countless times. I felt so safe going with her and she is one of the nicest people you’ll meet. 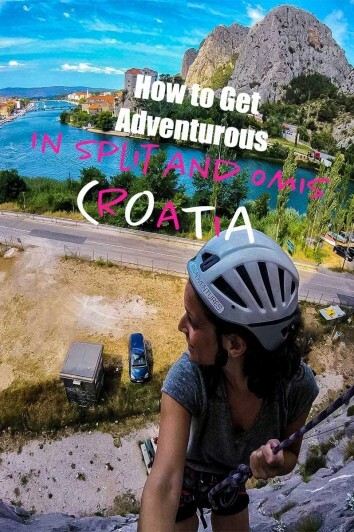 Should you want to stay in Split, rock climbing, deep water soloing, and more can be done there as well. I actually love kayaking! I find it super relaxing but it’s still an adventure. There isn’t anything TOO crazy to do or see if you kayak around Omis but you can end up on secluded little beaches where there’s nobody around. 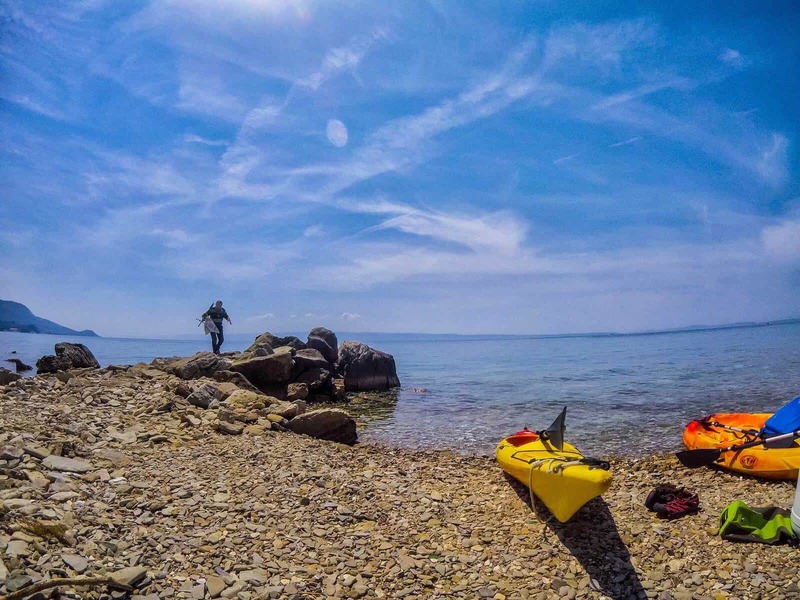 Kayaking along the Adriatic Coast…There are worse things in life. Kayaking Omis: You can go on a kayak tour and meet some new friends or go solo and rent from Lestrigon which is located two seconds over the Omis bridge on the left. It’s 150 Kuna for the whole day. Kayaking can be done in numerous areas around Split and Omis. Bene beach has some kayaking which is just outside Split city center or you can easily book a tour and not have to worry about it later! Take the forest route to get to this incredible fortress perched up on a cliffside overlooking the town. The fortress entrance is just before the tunnel when you go over the bridge if you’re coming from Split. Park your car just before the tunnel and make your way towards the mountain, you’ll see some signs that show you the path. The hike up isn’t that difficult but it definitely is a bit steep and you might see some critters. I actually saw a snake slither just a foot in front of my walking path, so be careful. 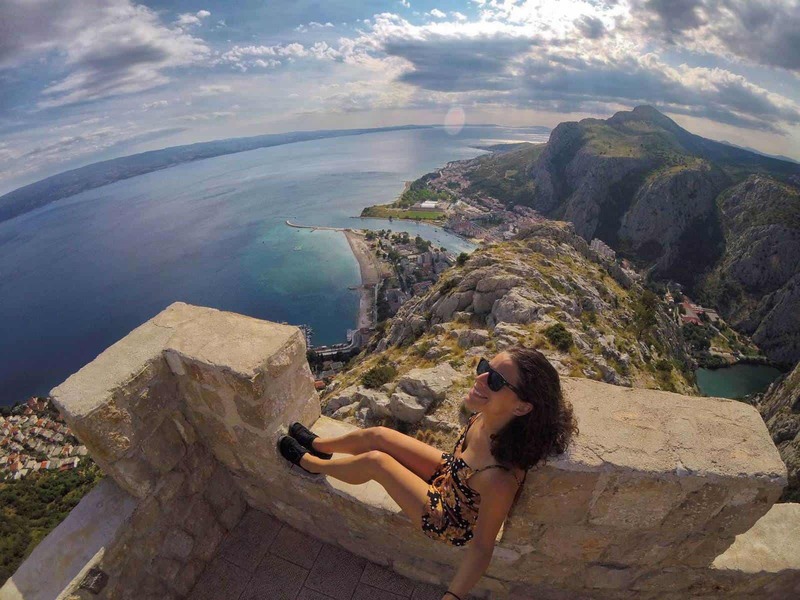 Make your way up on crumbling rocks, dirt, and then some rickety steps and take in the reward… An epic view of Omis and the surrounding islands! There’s another route to get in if you want to start the hike through the town, however, I recommend coming up through the forest. It’s a bit more adventurous this way and you’ll be shaded by the trees as opposed to being exposed to the sun on the other route. 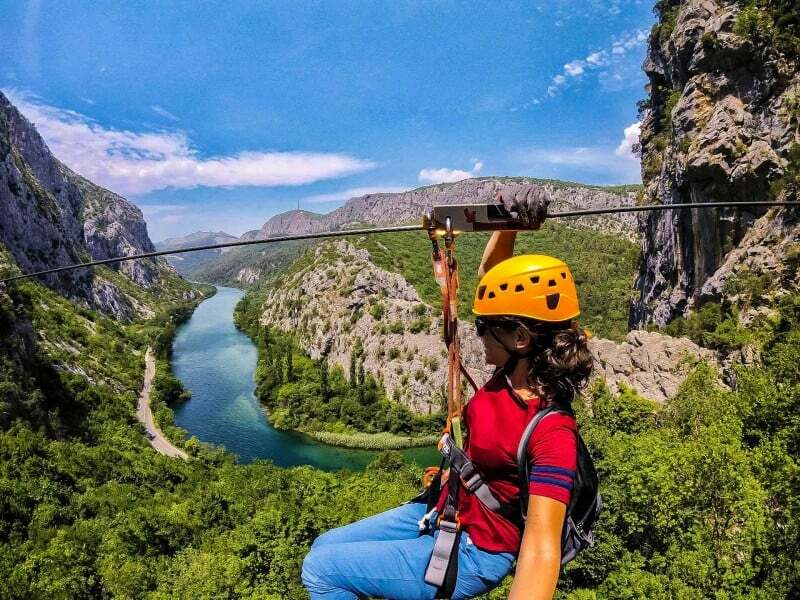 I wasn’t really familiar with this adventure sport but I now know it involves abseiling rocks faces, cliff jumping, playing in waterfalls, and essentially finding your way through nature’s maze that is the Cetina River. Yes, please, and thank you! I’d love to do this and I’m bummed I missed out… Next time, Croatia, next time. Damn. I was so close to doing this one but while the weather was simply perfect out, that nice breeze is actually the Bora which is high winds, aka not safe for paragliding. I enjoyed other things while the sun bronzed my skin and the wind whipped through my hair… Next time though, I want that bird’s eye view of the gorgeous Dalmatia Coast! Location: Lots of places along the coast offer it but Makarska and Omis are your best bets. More info: Local inside tip and word on the street is to just find the stands offering paragliding! They are licensed and usually have a fair price. Some of the best things to do around the Dalmatian Coast is to wander and enjoy the beauty! Ah, I got to stare at this mountain for days and just didn’t have enough time to adventure up there. I was busy adventuring down at sea level. Too bad. It’s incredible to see such an impressive mountaintop right there at the end of the sea, this is quite rare which makes these mountains even more special. For the adventurous people, hiking up will take some true stamina and you should be prepared in advance! However, you can drive up here if you have a car. Don’t think you don’t need to be adventurous though, the road is apparently quite tricky and dangerous. You can read more about this Split tour here. This beautiful day trip from Split to the mountain you see in the distance would be a great choice for the adventurer. Get out of the city for a bit and instead, get a bird’s eye view from the tallest mountain in Split. Yes, yes, yes, all the beaches! After all that adventure, you need a place to just chill, right? Bacvice Beach is probably one of the more popular ones as it’s just so convenient. It’s right there on the edge of Split city center. You can come here to watch the famous Picigin ball game that’s particular to this area. Walking along the beach you can get to Firule Beach too. To get a view of Split you can climb up Marjan, that large green area just west of the city and end up at Bene Beach. Personally, I think Omis and Makarska have much nicer beaches and they are pretty easy and obvious. Considering the towns are small there’s really just one beach. Omis Beach and Gradska Plaza in Makarska. If you’re feeling extra adventurous, you can take a walk passed Deep Makarska (a cave bar) and walk along the nature trail for about an hour until you reach Nugal Beach which is a nudist friendly beach just outside of Makarska. If you’re renting a car and driving around these places there will be 100 other beaches to stop at and enjoy as well! There’s no shortage of sun, sand, and sea in these parts! In fact, that can be said for all of Croatia. Next time, I NEED to check out all the islands that Croatia offers, especially in this area, they are some of the most beautiful and popular! There are plenty of things to do on Vis, Korcula, and Hvar… but they will have to wait until next time. if you are short on time like I was but have a day to squeeze in some islands, you get the most bang with this tour from Split. Side note: I’ve already linked to her tours above but if you haven’t checked Iris Adventures out yet, please do. I took numerous tours from Split with her and she is FAB. She is a professional rock climber and total badass in life. Her tours are top noch and you should try at least one! With all of the adventurous tours from Split, one would get quite addicted to the vibes and ventures in the area. I’m fiending to go back already! By the way, I did everything here SOLO! So if you’re wondering, as a solo female traveler, if everything was OK, YES! I felt 100% safe here. Go and have fun! Which adventure activities are up your alley? Which of these day tours from Split are you most looking forward to? How about visiting Croatia’s neighbor and hop on down to Montenegro? Here’s are some photos to entice to go to Montenegro or skip right to an epic one week in Montenegro itinerary! Pin this if you LOVE Croatia!